In the north part of the Valley a wonderful surprise awaits you. 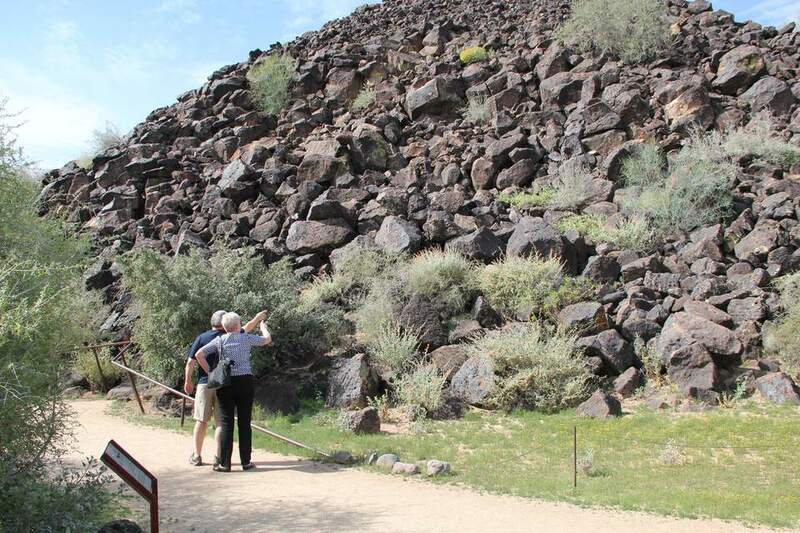 The Deer Valley Petroglyph Preserve has been open to the public since 1994. At that time it was known as the Deer Valley Rock Art Center. It is also listed on the National Register of Historic Places. The Deer Valley Rock Art Center is operated by Arizona State University School of Human Evolution & Social Change. The land is leased to the University by the Flood Control District of Maricopa County, which owns the land. The building housing the indoor exhibits was built by the U.
S. Army Corps of Engineers as part of the agreement arising from the construction of the Adobe Dam in 1980. The Deer Valley Petroglyph Preserve is the location of the Hedgpeth Hills petroglyph site. There are more than 1,500 recorded petroglyphs on almost 600 boulders. Research is still being conducted on the 47-acre site. The Center for Archaeology and Society’s Deer Valley Petroglyph Preserve is managed by the ASU School of Human Evolution and Social Change in A.S.U. 's College of Liberal Arts and Sciences. A petroglyph is a marking carved into a rock usually using a stone tool. Some of the petroglyphs were made 10,000 years ago. The petroglyphs at Hedgpeth Hills were made by American Indian people over a period spanning thousands of years. Petroglyphs represent concepts and beliefs that were important to the people that carved them. Some of them may have religious significance. Occasionally you will see a series of carvings that might be telling a story of some kind. Some of the carvings are of animals and may relate to hunting. Petroglyphs are important because they represent a permanent record of people and their migrations. This location appears to have been known as a sacred site for many tribes and generations of Native American peoples. Hedgpeth Hills may have been well known to American Indian people throughout the ages due to the confluence of various water sources and the fact that the site was east facing (toward the rising sun). You will be able to see an instructional video and exhibits in the indoor facility. Outside, there is a marked trail that takes you on a quarter-mile easy walk on a dirt path through the most concentrated area of boulders. You will see lots of petroglyphs! Bring your binoculars or you can rent some there. There are written materials for self-guided tours and guided tours are available for larger groups and schools. The entrance fee is very reasonable and the people are very helpful. Your visit will probably take between one and 1-1/2 hours. In the summer, junior archaeologists can attend camp here! Deer Valley Petroglyph Preserve is located in North Phoenix at 3711 W. Deer Valley Road, not far from where the Loop 101 and I-17 intersect. October through April: 9 a.m. to 5 p.m.
No, there is an admission charge. A.S.U. students and museum members are admitted free. Admission is usually free on Smithsonian Museum Day in September. The Deer Valley Petroglyph Preserve is probably not like most museums that you have visited. Bring a camera. Photography is permitted. For taking pictures, the best time to visit is actually at sunset -- but the facility is not open then! Second best time is probably early in the morning. The angle of the sun at different hours will determine how easy the petroglyphs are to see and to photograph. As you see a rock with petroglyphs, you'll notice that they look different from different angles. I always forget to bring binoculars. If you don't have binoculars, you can rent them at the Preserve. The main attraction, the petroglyphs, is outdoors. Be advised, it is hot in the summer. The path is short, so if you can walk from a distant parking spot at Walmart you can take this walk. It is not paved, however, and is uneven in places. Wear comfortable shoes. If it is sunny, wear a hat, sunscreen, and sunglasses. There is no restaurant here. Bring a bottle of water with you. This is a sacred site. There is no smoking, don't touch any of the boulders, and for goodness sake, please don't try to take any -- or parts of any -- of the boulders home with you. Pick up the trail guide at the front desk when you check in. It will help point you in the direction of some of the petroglyphs. Sometimes it takes a while to know what you are looking for! There is a video inside (air-conditioned) that serves as a good introduction to the history or the site. There are indoor exhibits, but they are not extensive. Who should visit? People who are interested in the history of native people of the area, or geology buffs. This museum has a fairly narrow focus, and so if looking at rocks with petroglyphs doesn't interest you after the first five minutes...well, then five minutes it is. It is a pretty area for a walk, and there are some wildflowers during the season! Likewise, there aren't really hands-on activities or interactive hi-tech gadgets for the kids, so keep that in mind. See the Variety of Beautiful Birds You'll Find in and Around Phoenix, Ariz.